The Perkins group uses its precision AFM technology to measure the tiny forces and structural states involved in the folding and unfolding of individual molecules of proteins and nucleic acids in their native wet, warm biological environments. How proteins fold and unfold normally––and sometimes misfold are crucial questions to understanding normal physiology and many of the most widespread and devastating diseases, such as cancers, neurodegenerative diseases, and some heart diseases. The Perkins group had already used their AFM technology to reveal new details in the biomechanics of key proteins. Now by enormously increasing the rate of acquiring these precision measurements, the group’s latest AFM technology will provide bioscientists with a flood of new crucial information. The group accomplished this game-changing feat by (1) developing a relatively easy and reproducible method to anchor a target biomolecule with special chemical groups to an otherwise non-stick cover slip and an AFM tip, and (2) creating a novel protein-stretching platform that allows the researchers to efficiently embed different proteins under study into a larger protein structure. The researchers also engineered the attachment to the cover slip to be permanent, but the attachment between the biomolecule and the cantilever tip to be mechanically strong, but reversible. This configuration prevents buildup of unfolded protein on the AFM tip, making it possible to repeatedly use a single tip to study hundreds-to-thousands of proteins over relatively short time periods. With this system, it is now possible to fully characterize the folding and unfolding of a protein in one or two days. The new technique produces useful scientific data up to 100 times faster than older ways of doing similar research. 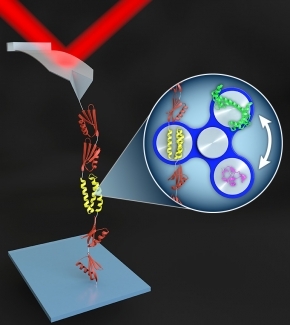 Two key innovations came together to produce the precision biomechanical studies now occurring in the Perkins Lab: First, the group teamed up with Prof. Marcelo Sousa’s lab to make a protein-like backbone (called a polyprotein) that not only adhered strongly to the AFM tip, but also readily attached or detached to the protein or nucleic acid to be studied. Second, the researchers figured out the chemistry that allowed them to solidly anchor the biomolecule on a cover slip or other surface. This precisely engineered system has opened the door to many years of fruitful research.